Just one qualifier: I’m referring to warm-weather rain. I don’t condone this practice at 35 degrees, so don’t blame me for any purpled, unmoving digits. Just spring drizzles and summer sun showers, when it’s warm enough that the more “responsible” rain shoes (say, rubbery boots) have been ruled out, just on grounds of foot comfort and outfit coherence. Otherwise, I am suggesting, unironically, that Tevas are your best option for when water starts falling out of the sky. Built to withstand water. Tevas were invented by a Grand Canyon river guide. If they can handle submersion in a body of water, they can handle all your sidewalk puddles. These Styrofoam-y slabs are resilient, drying off and returning to normalcy as soon as they’re out of wet conditions. Meanwhile, your sneakers will structurally take a beating, get streaked with grey-black asphalt juice, start breeding a pungent batch of bacteria, etc. No socks. Socks are the worst possible thing for Rain Feet, your greatest liability. Wearing socks is effectively like strapping on twin sponges, guaranteed to absorb and trap any waterborne nastiness right up on your skin until your next opportunity to peel them off. Pruned skin chafing against wet cotton results in prime blister-making conditions. Cruising into the coffeeshop with your breathable Tevas, even if they’re a little damp, will always be more socially acceptable than removing your waterlogged sneaks and shucking off your dank tube socks to air-dry. Feet guaranteed to get wet. Depending on where you live, this may be a more or less repulsive prospect. Maybe you don’t want to be directly exposed to the runoff of your streets, but you’d be in a similar situation given enough sneaker soak-through, with no hope of a dry-off or rinse-off by relatively cleaner water. Potential scorn from fellow pedestrians. Let them stare. 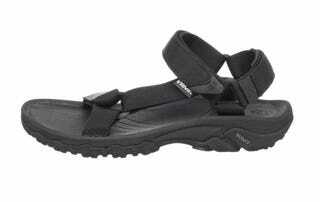 Also, you may spy “cool” kids rocking high-end versions, but I see no reason to upgrade from the OG all-terrain sandal. It’s a virtuous compromise: Tevas get you wet, but you reap the benefits of an automatic and efficient dry-off as soon as you’re out of the rain. This is better than envisioning expert puddle-dodging and no-soakage perfection, inevitably falling short of that goal, and feeling soggy for hours. Experience the victory of conceding defeat. Your feet will thank you, and your coworkers will eventually get over it.